The client was planning a multi-million dollar, major capital project which was to install equipment between a product depalletiser and 7 high-tech packing lines. 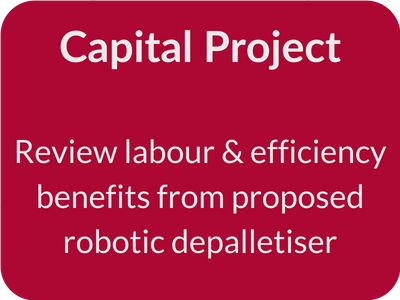 The project justification was based on labour reductions while maintaining and enhancing operating efficiency. Due to space restrictions, accumulation levels between the depalletiser and the packing lines needed to be reduced. The client wanted to know if the project benefits could still be achieved with the reduced accumulation levels. A factory level Value Stream Map which included the anticipated levelled production schedules for the 7 packing lines. A Process Map (Bullant Filters) showing the distribution of capacities and buffers across each of the packing lines. 3D dynamic model showing the capability of the depalletiser to feed all 7 packing lines with different accumulation levels. The 3D dynamic model showed quite conclusively that earnings from labour savings would be offset by a reduction in operating efficiency caused by a reduction in accumulation levels. The client decided not to proceed with the project avoiding investing in a project that would be incapable of achieving an acceptable return.